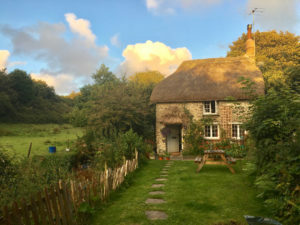 Philham Water Cottage sits beside a stream in a secluded valley two miles from Hartland and the coast of Devon, though Cornwall is less than five miles to the south. Driving: Most guests will probably prefer to drive here via the A361 and the A39. Detailed directions and the code for the key lockbox will be sent after your booking has been confirmed. A GPS will be a helpful aid for first-timers. The nearest place to refuel your car will be in either Bideford or Bude (fifteen miles from the cottage) so you may want to consider refuelling before arrival. Detailed driving directions from Barnstaple will be sent to you, after your booking has been confirmed. Rail, Bus & Taxi Services: There are rail services to Barnstaple, and bus services from Barnstaple and Bideford, where it is also possible to get a taxi. A taxi journey from Barnstaple to Philham Water was £40 at last time of research. There are several car rental companies in Barnstaple. The bus ride from Barnstaple to Hartland (a 40 min journey by car) takes about 60 – 90 mins and, once arrived in Hartland, you are still 2 miles from the cottage. Paul, our site manager who lives in Hartland, may be able to provide you with a taxi service to and from the cottage if you arrange it with him in advance. (For his contact details please email mirvanya@gmail.com.) Be aware that there is no bus from Hartland to Barnstaple on a Sunday. By Rail from London: Change at British Rail Exeter for the ‘Tarkaline’ to Barnstaple. 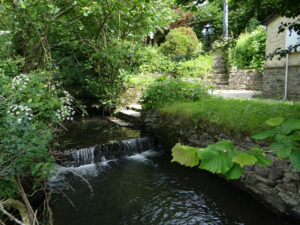 This is a very picturesque route which connects with the bus to Bideford, though Barnstaple is probably better for renting a car. 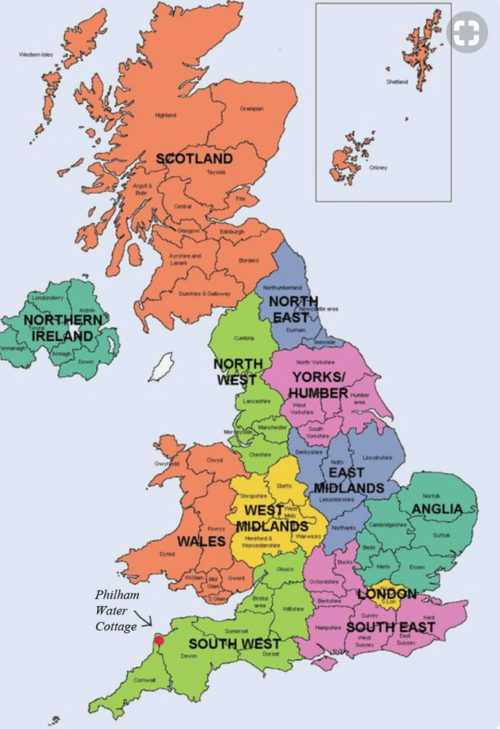 Megabus now provides cheap intercity coach travel, and National Express also provides comfortable long-distance travel to this part of England from London. There is a daily bus service (except Sundays) from Bideford to Hartland. A seasonal service operates from Bude to Hartland. Wow Airline (Icelandic) and Norwegian Air offer competitive fares to Europe. Virgin Atlantic offers a 10.5 hour flight into Heathrow, where you can pick up a rental car. then catching a morning Flybe flight from Charles du Gaulle Airport (outside Paris) to Exeter, where it’s possible to rent a car and drive the 1.5 hrs hours to arrive at Philham Water Cottage in daylight. As you would most likely be booking “return” flights, you would have to also consider the timing of the several stages of your return journey. Flybe, easyJet, Vueling, Ryanair, Jet2 and bmiregional are the low-cost inter-europe airlines that will fly from European cities into the regional airports nearest to north Devon, i.e. Exeter or Bristol. 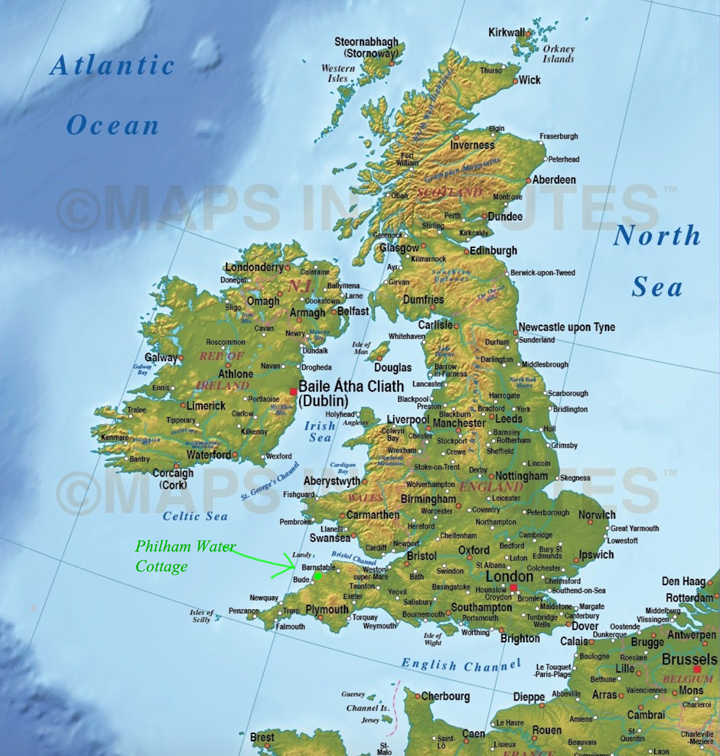 Wow Airlines flies from San Francisco via Dublin to Bristol regional airport, (though you change planes in Dublin), and from Bristol you can pick up a rental car to drive to the cottage. However, timing your journey to arrive during daylight hours might not be easy, and even though Bristol Airport is the next nearest airport to Philham Water after Exeter airport, and much closer than London Heathrow or Gatwick, you will still have a two+ hour drive from Bristol Airport to Philham Water.